Following on from Crew Tether Spin - With Final Stage - On Routine Mission To ISS - First Human Test Of Artificial Gravity?, I've got some great videos to share now, showing the Soyuz and final stage spinning to create artificial gravity, over the turning Earth, against the stars. So, let's take a look at the highlights of the mission in video, ready for the Space Show webinar on artificial gravity. Then, gentle tether spin just to keep the tether taught soon after separation of the Soyuz from final stage. 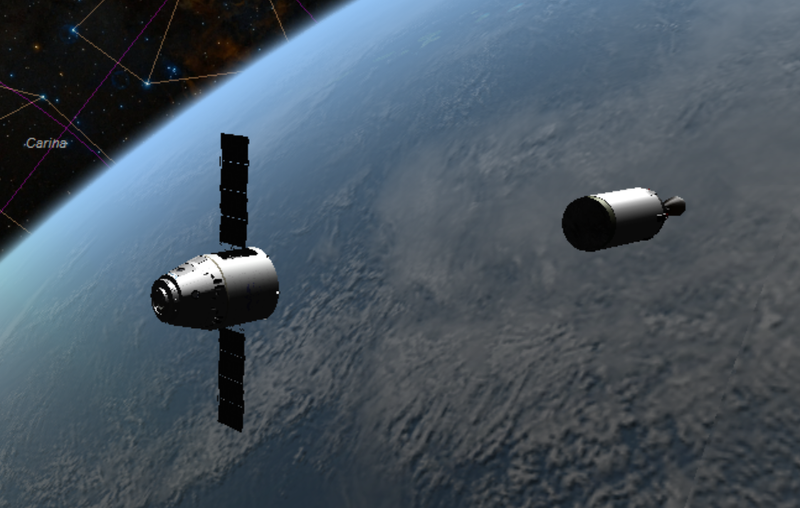 All these videos are done in Orbiter, a remarkable space mission simulator by Dr. Martin Schweiger with lots of add ons contributed by enthusiasts. Thanks to Gattispilot, for making the tethers for these animations and for techy advice about how to attach everything together. That cube in the centre of the picture is just a visual indicator of the position of the c. of g. The real tether wouldn't have it. where all the boosts are done in Southern hemisphere, with the Soyuz moving in direction of orbit in its tether spin. The tether release happens in Northern hemisphere, a couple of days later - when the Soyuz is still a long way from the ISS and at a lower altitude. Uses hardly any fuel because the final stage ends up in an orbit with same semi-major axis - so with same gravitational potential energy - so all the energy from the boosts goes into the Soyuz on release of the tether. We have available, 15.7 m/second of delta v for the spinning. Tether can be any length but delta v has this as maximum. This is 100 meter tether and 6 rpm, crew at 12.5 meters from tether centre of gravity - a spin rate that less susceptible individuals were able to withstand long term in rotating room experiments - taking one day to adapt after which they were symptom free. For details of these and other experiments see Theodore Hall's dissertation on artificial gravity. As it's just an add on experiment you wouldn't select the astronauts based on their susceptibility - but could certainly attempt to pre-adapt them with rotating rooms and pre-test them for susceptibility - and f it turned out that all the astronauts in the mission were low susceptibility and could withstand 6 rpm long term in rotating rooms on the Earth - it could be well worth a try. Or you can achieve 0.5 g at 50 meters and 3 rpm, total tether length of 200 meters. This is half g, same delta v - at 3 rpm many people might be expected to tolerate it long term with only mild symptoms, if the Earth experiments are a guide. So you could gradually let out the tether, once you achieve the required delta v - to try several different levels of Artificial gravity - for the same delta v. Using strong releasable tie-downs at, say, 50 meters for early experiments - then 100 meters, 200 meters, then 600 meters. Even most highly susceptible people have no problems with 1 rpm stays long term in rotating rooms on the Earth. So probably this would be fine for everyone in space also - that is if the Earth experiments are a reasonable guideline which nobody knows of course. Probably the crew would spend most of the mission doing this - though you could vary this from one mission to the other to get data for different regimes depending on what is of most interest for research etc. Finally then the tether release sends the Soyuz into higher orbit on its way to the ISS, with almost no loss of fuel over a standard mission - and sends the final stage to a targetted return to an empty part of the Pacific ocean. see Crew Tether Spin - With Final Stage - On Routine Mission To ISS - First Human Test Of Artificial Gravity? That's also got links to the original paper, and lots of other references on artificial gravity and links to follow up. You can use the same method with any rocket launched mission with a final stage that goes into orbit. (Indian MOM mission was an exception because of its use of gravity assist from Earth). The webinar will be streamed from The SpaceShow on ustream. For full details see the space show newsletter. If you can't watch it live not to worry, it gets archived soon after. I'm happy for anyone to share and re-use the videos in any way so long as they are attributed. The obvious thing is to release the videos on youtube under CC By which makes the videos available for anyone on youtube to mix and re-use as they like. However, youtube videos released under CC By in that way can be used commercially. Orbiter's license would permit that, and I'm okay with that myself - but most of the add ons have no explicit license. So, I think you would need to ask the developers of all add ons used in the simulation to release it with that license.